The most famous of all the Sibyls is the Kuma Sibyl. Many Sibylins of the book are connected with her name. It was she who predicted the demise of the whole world. Kuma Sibyl oppresses its excessively large body and deformity. 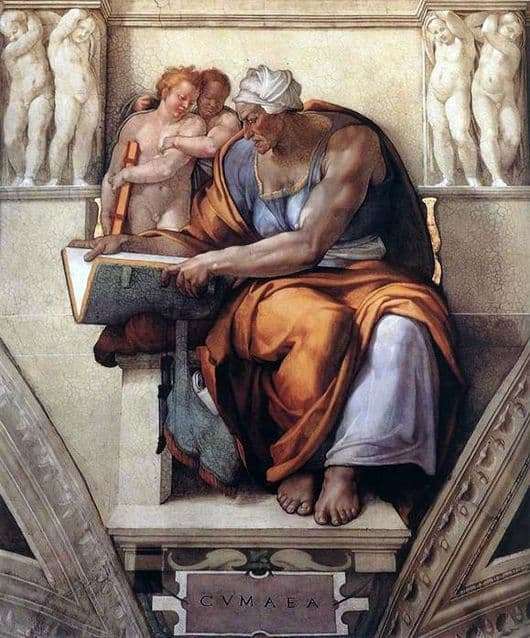 Michelangelo with all the subtleties conveyed the image of this deep old woman, with a powerful body, sitting on a marble throne reading an ancient book. The content of the volume obviously captures it. The old woman is absorbed in the difficult task of interpreting what she read, apparently in this book she read some prophetic truth. Her frequent mention in art overshadows any other Sibyl, even more beautiful and young prophets. Kuma Sibyl is a Greek priestess who lived long in the Italian city of Kuma. Appolon himself fell in love with her, as a result of which she received a divination from God as a gift and a life that will last as many years as a priestess can be located far from her native land. Years passed, generations died after generations, only one Sibyl did not see death and grief. But it did not last long. So far, the soothsayer did not understand that she had forgotten to ask Apollo for eternal youth, because of which she quickly withered and turned into a terrible, wrinkled creature, who dreamed only of quick demise. The Kumsk sibyl lived for more than one thousand years and died a decrepit, shriveled old woman when the Greeks accidentally visited her, who brought with them a handful of their native land.